With awards comes publicity, which is a great way to show potential clients, employers and healthcare commissioners the amazing benefits different therapies offer. If you are uncomfortable with the thought of putting yourself forward for an award, think of it as putting your favourite therapy forward instead. If you work for a charity or similar, this will gain recognition, too. And remember – those who are shortlisted or highly commended can often gain just as much publicity as the award winner. In our annual FHT survey, we always ask, ‘What concerns you most as a therapist?’ and two key issues always come to the fore. The first is poor standards in training and practice, and how this impacts the reputation of professional therapists. The second is lack of recognition from medical and other professionals, which can hinder integrating therapies into mainstream care. Belonging to the FHT and being listed on our Accredited Register helps to demonstrate your professionalism, but awards also play an important role. Publicising the story behind each winner shows the world at large what best practice looks like, and how therapists can work as part of a multi-disciplined team to help improve patient-centred care and treatment outcomes. 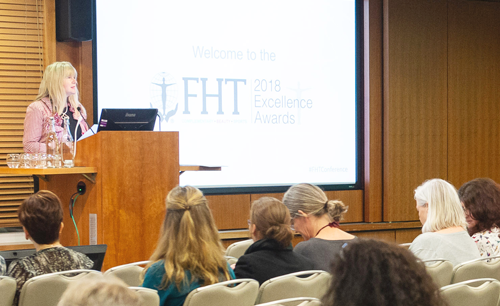 Awards that centre around education, such as FHT Tutor of the Year, help to champion those training providers who are going the extra mile to ensure students completing their courses enter the industry with the skills to practice competently and professionally. This is vital in helping to protect the industry’s reputation and public safety. Sadly, many therapy services rely on charitable donations and other sources of funding in order to continue supporting their clients. An award can help demonstrate the value of your work and strengthen your application for further funding. Similar benefits can be enjoyed by those involved in therapy research. Winning an award is a great way to boost your business. There is nothing vain or selfish in gaining some recognition and publicity for your hard work. Local media usually has a strong appetite for success stories involving members of the community. Being shortlisted or winning an award could mean appearing in the press or on local radio, gaining good exposure for your business and hopefully some new clients. If applying for work opportunities, it will also boost your CV and help to ‘set you apart from the rest’. Entering an award means stepping back and looking at your business from the outside in. It will help you identify what you’re doing well and what could be improved. Even if you don’t win, this is a really useful business exercise. If you do go on to win, knowing that you have been recognised as ‘the best’ in industry will impress clients who already use your services, and could encourage repeat business and recommendations. If you’re an employer, celebrating and sharing your award success with staff can be inspiring and motivational. An award can also be a great way to attract new talent if you’re looking to grow your team. This is your year – enter now!